OCM will be present at the upcoming MACC 2016 (Multi Agency Craft Conference) with an In-Water demonstrator boat; the new 9.5 Meter High-Speed Vessel Interdiction RHIB, launched earlier this year. The OCM cutting-edge design of this new RHIB features the latest state-of-the-art, shock-mitigating operator console. The entire console, equipment and crew are fully-suspended on twelve inches of full-floating, 3-axis, articulating pneumatic shock-absorbers. This unique RHIB also features the latest in navigational and communication electronics as well as the newest Evinrude G2 Outboard Motors; 600 horsepower in all! Tested and reviewed by boattest.com, this great military & law enforcement Rigid Hull Inflatable Boat got the greatest review. According to Test Captain Steve Larivee, the Ocean Craft Marine 9.5m just made his job the coolest in town! Very impressed by its performance, he claims that testing the OCM Vessel Interceptor tops up all other test! “She ran 55.0 mph in our tests, jumped on plane in 3.3 seconds, and went 0 to 30 mph in 5.5 seconds. This, for a boat with a very substantial test weight of 6,920 lbs. (3,139 kg) is impressive indeed.” He continued. 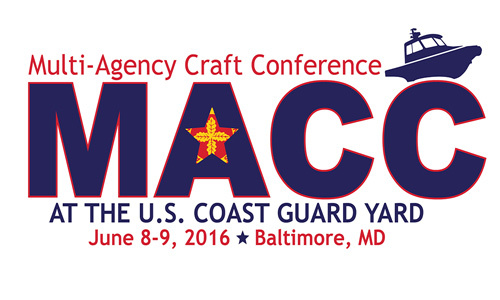 Visit OCM’s In-Water Display at the Multi-Agency Craft Conference (MACC) on June 8-9 2016 at the USCG Station in Baltimore, Maryland.